All date-setters have to deal with Matthew 24:36 where Jesus, speaking of His return, said, "But of that day and hour no one knows, not even the angels of heaven, nor the Son, but the Father alone." Harold Camping, owner of the Family Radio Network who has set the date for the Lord's return at May 21, 2011, dismisses this statement as being no longer true. He says it all changed in September of 1994 when the Holy Spirit began to be poured out and new revelations concerning the end times began to be given to true believers. He argues this is in fulfillment of a promise given in Ecclesiastes 8:5 where it states that "a wise heart knows the proper time and procedure." Once again, Camping just fishes around for some words to substantiate an unrelated point. Ecclesiastes 8:5 is specifically talking about being obedient to political leaders. It says that a wise heart knows the proper time and procedure to obey a royal command. The fact that it is so specific is the reason that Camping only quotes the last half of the verse. Camping also quotes Daniel 12:4 & 9. These verses state that certain end time prophecies will not be understood until the time comes for them to be fulfilled. This is certainly true with regard to prophecies that depend upon historical developments (like the re-establishment of Israel). The verses also relate to prophecies that rely on modern technology (like the whole world looking upon the dead bodies of the two witnesses in Jerusalem). But these verses certainly do not apply to Jesus' statement in Matthew 24:36 where He stated without reservation that no one can know the date of His return. Camping also points to 1 Thessalonians 5:1-5 which says that the Lord will return "like a thief in the night," but not as such for "brethren" who are "sons of light and sons of day." Camping argues that these verses mean that true believers can know the date of the Lord's return. But that is not the meaning of this passage. Instead, it simply means that believers can know the season of the Lord's return (and not the date) because we have been given signs to watch for. 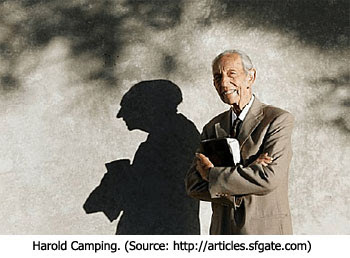 In the next part of this series examining the madness of Harold Camping's date-setting, we'll look at why he is ultimately the leader of a cult. I listen to Family Radio from time to time. I love the music they play and appreciate the Bible readings from the KJV. But the rest of their programming is nuts. For the longest time I've been trying to formulate a conclusion as to whether or not a person can get saved listening to their programming. In addition to Harolds teaching on the coming of Christ and the end of the church age, Camping believes in annihilationism--something I don't find in the Bible. However, as far as I can tell they believe salvation comes by grace through faith, and not of works. I believe there are some saved folks being led astray. The bride of Christ must ready to help these fallen brothers when this May 21st prophecy collapses! I do so agree with you Scott! The photo of the lady with the advertising on her car. I wonder how much that cost her to be done, and how much to get it rectified after 21st May? She has such a lovely confident smile, my heart goes out to her, and others who have been caught in the snare of this particular 'fowler'. The ONLY way a lot of hurt and confusion can be avoided is if Jesus comes for us before that date. where He stated without reservation that no one can know the date of His return. Why do men keep trying to date set when the Bible says we can't know the date? This baffles me to no end. (Matthew 24:36) But of that day and hour knoweth no [man], no, not the angels of heaven, but my Father only. (Mark 13:32) But of that day and [that] hour knoweth no man, no, not the angels which are in heaven, neither the Son, but the Father. (NAS) "But of that day and hour no one knows, not even the angels of heaven, nor the Son, but the Father alone. Sorry, i didn't know some of the other translations added "nor the Son" to the text. These different translations can be confusing.